The Central Texas Conference (which is a geographical region in which 300+ churches are grouped together) celebrates 100 years in existence. To celebrate this anniversary the conference decided to throw a big party an invite all the churches to set up tables in the Will Rogers convention center. These tables will have the history of each community of faith in the conference with pictures and a narrative for people to learn about them. The conference decided that this event would be an opportunity to invite Willie Nelson not only because he is from the area but also he grew up Methodist. :Loads of people were exited and the churches plugged this celebration as an opportunity to hear Willie Nelson. Kinda neat. Until Willie Nelson drops out. People are not happy. People are concerned that the attendance will be hit dramatically. Because, lets be honest, how many people are really drawn to the idea of looking at a bunch of slide shows of churches they do not know about. I am saddened by this whole thing. And not that Willie Nelson will not be there. Our conference has the opportunity to share with the whole central Texas area that what the UMC has done in this part of the country. We have build hospitals and schools and feed countless people only to be outnumbered by the amount of people we have clothed. We have joined with the major metropolitan areas to help with homelessness and we have helped create cross religious conversations and ministries. We created Metropolitan board of missions and United Community Centers. We have campus ministries and youth ministries and built homes. The Central Texas Conference has done so much and the best way we could think to celebrate it is to have slide shows and Willie Nelson. Did I mention that Willie Nelson is not coming? Did I tell you how much people are questioning this event at this point? Did I mention, that to my knowledge there is no worship of God? Is the music and celebrity of Willie Nelson more transformational that the mission and ministry of God through the Central Texas Conference? Is Willie Nelson more important or has had a much greater influence in the lives of people in the Central Texas area than the United Methodist Church? Willie Nelson will not be there but you can be sure the Living God for whom created you and me and gives life to the entire world will be there. But even that might not be a big enough appeal. It is my understanding that Marx's comments that religion is the opiate for the masses that he was speaking to the idea that the rich and powerful (bourgeoisie) were using religion to keep the people's (proletariat) minds occupied with "other worldly things". In keeping peoples minds occupied with things that allowed the bourgeoisie to maintain the status quo and keep the proletariat from thinking about how they could change the system of oppression and move out of poverty. I am not a Marx scholar and it has been a while since I have read him, so I could totally be wrong. Nonetheless, I saw in the June 28th 2010 issue of Time magazine that John McCain tweeted a response to Snooki from Jersey Shore after she "wrote that McCain would not have imposed a tanning-bed tax like the Obama Administration's, which goes into effect July 1." It really got me thinking about the very large amount of media devoted to celebrities (both traditional and those "reality" celebs). There are so much print media and websites devoted to these people and it makes me think that perhaps in our day (to update Marx if I so may) "Celebrity is the opiate of the masses." I am not immune to this myself. 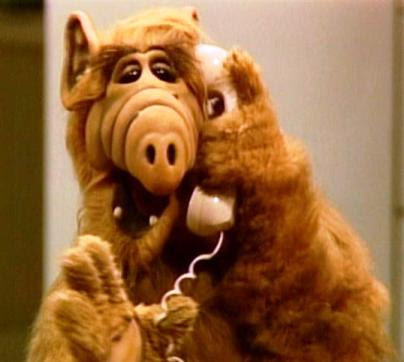 I keep up with my fair share of celebs (is Alf a celeb still?) But I wonder what we might be missing as we allow ourselves to be distracted by the "other worldlyness" of the cults of celebrity? What sort of life could we be living? What sort of world we help create?